The Seals Adventurer kayak spray skirt is the perfect skirt for light to medium conditions. Constructed with medium-weight coated pack cloth, double-stitched and sealed seams and and adjustable waistband, plus a tensioned deck stay to help shed the water faster. I was very pleased with the quality of materials and construction. Excellent fit and the grippy stuff at the cockpit combing is a nice touch. Cost to quality is awesome! It's going to last me a long time. Oh yeah the implosion bar is great. This skirt is well made and does the job, but I wish I'd spent $20 more and gotten the Sneak with its front zipper. It's much easier to get into. Nothing wrong with the Adventurer ' and it's fine once you wriggle in it ' but I prefer the easier accessibility. **Calling all size 7.0 users** Seals is the only company that I've found who makes a spray skirt big enough for my 12' Old Town Vapor kayak, in size 7.0, and so far I am happy. There is one very large drawback of a skirt this large (rather, a cockpit so large it requires a spray skirt this large): When installing, you have to start at the front and finish at the back. This is backwards of how it is supposed to be done, but it has to be installed this way. I am 6'2'' and I cannot even reach the front of my cockpit when seated. Because of this, when installing, you have to start at the bow and work your way back to the stern...meaning the hardest part with tension at highest is right behind you. It is awkward and cumbersome. After practicing several times, my arms were exhausted. If you are a woman or not super strong, you probably won't be able to install this 7.0 on a big cockpit kayak (like Vapor or Dirigo 120/140XT) at all by yourself. You will have to have someone help you put it on. Because you cannot reach the very front on large cockpits, for safety, Seals has sewn an orange grab handle up the skirt and within easy reach to release the skirt. Now, as far as fit, it fits well on my body. I have a 36'' waist and it could probably accommodate much larger. Fit on the kayak is pretty good. There are no saggy areas, which is important. 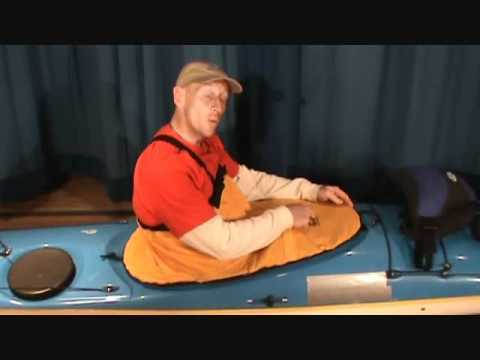 On my Vapor kayak, it has the high back seat, which does seem to interfere with the skirt some. It definitely makes the spray skirt much tighter behind me because the high back seat protrudes from the kayak. As for side fit, directly on my sides (at the widest part of the cockpit), the spray skirt doesn't reach down far enough into the cockpit rim to make me feel totally comfortable to use this in big waves. It maybe has 1'' overhang on the rim at the widest part, and could fit another 1-1.5'' comfortably. I also have a Seals cockpit cover for storage and it fits identical, being about 1-2'' too tight at the widest part. If you dip the side of the kayak into the water, you will definitely have water run up under the skirt. This skirt is best served for rain and the occasional big waves splashing over the deck. That said, on an Old Town Vapor, this skirt gets really tight around you and could be a touch bigger. I have not done enough paddling yet to give a firm answer as to if it accidental pop-off will be a regular issue. If it is, I will revise my review. I bought 2 Seals Adventure Spray Skirts with a great deal of help from ACK and Seals. I didn't know anything about sizing the skirt but became well informed after talking with both companies. I rec'd the skirts quickly and they fit (even though I wasn't sure the cockpit lip would keep them on). And got free shipping too! The skirts are good quality and my grandson has taken his out already in cold weather. Fit Solara well. Keeps legs dry when paddling in cooler water. 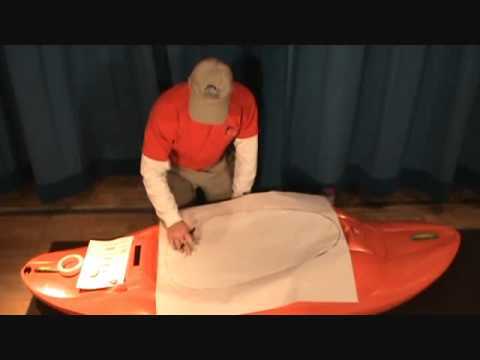 Easy to get onto kayak and there are good how-to videos on the website regarding proper fitting and use. Makes my cool water paddling more enjoyable. Really nice sprayskirt, it breathes better than neoprene. It might not be appropriate for huge whitewater. I was not happy with the half skirt as the mesh pockets were abrasive when I hit it with my knuckles. This material is smooth and with no bulging pockets can not interfere with paddling. Easy on and off. Much easier than the Seals cockpit seal to install. Stand up and it comes off readily with no need to grab the handle. Pull the handle for cockpit access and the rear stays put till you re-install the front. Pockets are on the PFD so when you stand up the skirt is not sagging from a load. The light weight suspenders are easy to disconnect for skirt removal and installation. Chest strap can be loosened for ventilation. This is a great spray skirt - I used it on an older wide mouth kayak and it sealed perfectly. Glad I had the suspenders and no problem getting the spray skirt off the kayak in the river. great skirt works for the purpose on a wavesport ace 5.1 it works great and has been tested in large submerging rapids. Also a very durable material and quality product in general. Well made skirt. Kept the water out of my kayak while going down some rough falls and rapids. I would recommend buying from Austin Kayak. Cheapest price for skirt that I found at the time and shipped quickly. These do exactly what they are designed to do. Keep water out. They are not completely water proof. As I laid over sideways and braced my partner's boat, completely submerging a portion of the skirt, I did feel a slight trickle coming in. No big deal. It will basically keep water out and the kayak mostly dry. Works good. Keeps water out during rolls. I haven't had it implode on me, and I've taken some pretty decent waves over the bow during a SCA. I recommend this skirt for light to moderate paddling. works great as specified. A rainy, windy float and stayed dry inside for the whole 6 hours. Thanks, guys! The skirt is a good fit on the and keeps me dry. The sizing chart was accurate. Wasnt wild about the straps at first, but after adjustment, they do keep the tunnel from bunching up. The deck stiffener does a good job keeping water from puddling. This skirt seems to be solid and well made with the exception of the suspenders. They are cheap and thin elastic with thin, flimsy fasteners. It fits nicely into the coaming creating an excellent seal. Very little water gets in even when edging or when waves wash over the kayak. The body fits well too, but is comfortable and breathes a bit. If the suspenders hold up, this will be a first rate skirt. Everything was as stated. Worked great and met all my needs. Thanks! Nice skirt, fits very well, and not too hot in the summer. Great beginner skirt. Nylon seems to be easier to release in the event of a wet exit. I loved that ACK used a recycled box for shipping! The spray skirt fit my Dagger Zedeco very well. It will keep water out well for me, but not if I flip. But I am not that good at a roll anyway, so I will be doing wet exits. the price/value of the product is perfect. This spray skirt fit our Pungo 120 very well and kept the water out. We highly recommend it. looks and fits great! Good price too! No shipping or taxes. Quick delivery! The skirt worked perfectly, stayed on, did the job when hit with witewater. Peeled right off when swamped. Super value! I've used the skirt only twice on the Chesapeake Bay. I find it easy to get on and off and I am able to adjust it high enough with the suspenders so that water does not puddle. The bow also helps keeping the water off. My order came in 4 days. Good Product for the price Pretty easy to get on and off even while in kayak (while in flatter water). It shed water well and kept rain out. I like the suspenders as it helps keep the skirt high and water out ... but I had to basically tighten them all the way to use them (I'm 5'8"). I wish I could have bought yellow ... but black works just as well. Fits a little too tight, wants to try to pop off but has not yet. Shipped very fast. works as good as i need it to. Great value. 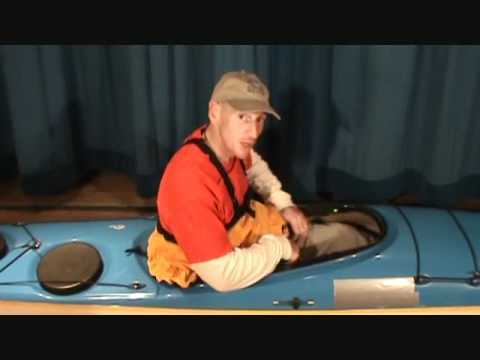 I wanted an inexpensive skirt to use on my recreational touring type kayak, with a tunnel that would fit almost anybody. When the waves pick up or the rain comes down, I wanted to be able to paddle back without swamping the boat. This fits the kayak and my needs perfectly. It is made of waterproof fabric that does't breath, so it gets a bit clammy in the boat. If you are planning on rolling, I would get neopreme, but for my uses it is a great deal. Fits great. Miss the pockets. I have same product on another kayak but with pockets and they come in handy. ACK ships fast and has the best deals. Great spray skirt for the price...works great! Very pleased with this spray skirt. Using it on a Heritage Featherlite & it works and fits very well. Service from Austin Canoe & Kayak 1st class. Excellent communications & a pleasure to deal with. 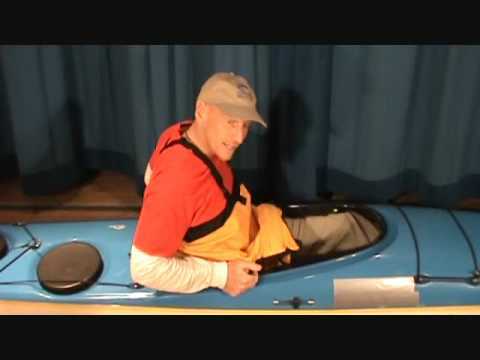 This is great for a recreational kayaker. It's not too tight so it goes on without too much effort and allows for easy opening to grab my water bottle from inside the cockpit. It seals just fine and the bow is a nice feature to shed any water and makes a nice place to rest the paddle on your "lap" during a break. This skirt is just what I needed for the kayaking I do here in Minnesota. It keeps the water (and snow) out on early spring trips through Class I & II rapids in my Old Town Otter, which makes for a warm and comfortable day. The service and shipping were fantastic. Thank you, Austin Canoe & Kayak. My order came in a couple of days. The skirt looks great. The sizing was right on. Works as advertised. A little tough to get on the first couple of times but no problem after you get accustomed to it. Awesome that Austin Kayak gets it out the door so quickly. Good quality no frills sprayskirt. I just wish it came in a color other than black. Ordering through Austin Kayak was hassle free. I found this to be an excellent product. Spray skirt is a perfect fit. Great product - good quality. Good material, Durable. Fits perfect. great price! The Adventurer Spray Skirt seemed to fit well. I was concerned that it wouldn't as I am very small in build. It comes up higher on my torso that the skirt on my Pungo, so it really helped when water came over the bow. A little awkward to attach, but then I'm new at it. Thanks to ACK for some FAST service!! Haven't used it yet, but it fits perfectly. Great stuff. a perfect fit and excellent quality I like the service a t Austin Kayak. I couldn't be happier, the Seals Adventurer Kayak Spray Skirt fits perfect,just what I was looking for. Can't wait to hit the water. I was surprised at the price right within my budget. This Seals Adventurer Kayak Spray Skirt works surprisingly well in my opinion. I have a Dagger Approach. The first time I used the skirt was on a class I/II creek and it held up very well. I went over a small drop and the front half of my boat went under the water and I prepared myself for my boat to fill up, but surprisingly not a drop of water came in. I have not tested the limits further yet, but I will and I think this skirt can take it. Great skirt for the price,and the online service at ACK was also great. The web site is great and informative. The shipping was fast. I have enjoyed the product and would recommend you to others. Went on a trip down PA's Pine Creek Gorge right after I received it. The creek was in flood stage and the weather was around 25 -30 degree. It kept me warm, dry and comfortable. The trip was more than I was used to, but the spray skirt held its own very well. Q: This is shown in yellow but the only color offered is black. Have you none in yellow? A: Yes, this spray skirt will work with a WS Tsunami 145. You would need the 1.7 size. Q: Is there a seals spray skirt that will nicely fit a Wilderness System Cape Horn 140? One seals sizing chart I found said a custom fit was needed for that model. A: Yes the 5.7 will be a little larger.